CALLAHEAD’S OVER HEAD STEEL SLING will lift a full size portable toilet to any level at the multi floor building construction site. Easily attached to a crane, the steel cable can lift and lower our full size port a potty into high rise buildings or skyscraper construction locations. 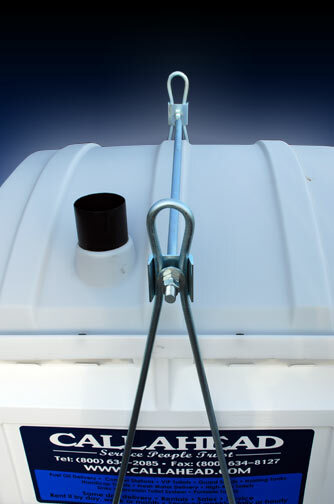 The OVER HEAD STEEL SLING is a durable steel sling that will provide safe and easy transport of the port a potty. 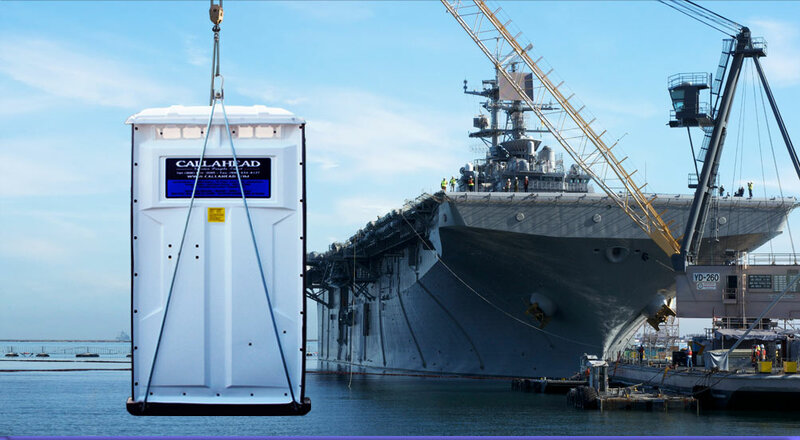 Designed specifically for the portable sanitation industry, to cradle and lift securely a standard size portable toilet. It will provide convenient and time saving portable restrooms to high rise buildings and skyscraper construction sites. Saving employers money from otherwise extensive time taken by employees to travel to the ground level to use the portable toilet. Especially in buildings without elevators or stairs, the OVER HEAD STEEL SLING will save valuable work time that is otherwise wasted by placing the port a potty in the vicinity of your workers. Building construction is a necessity throughout Manhattan. However, all over New York, all kinds of hard to reach construction jobsites are essential. 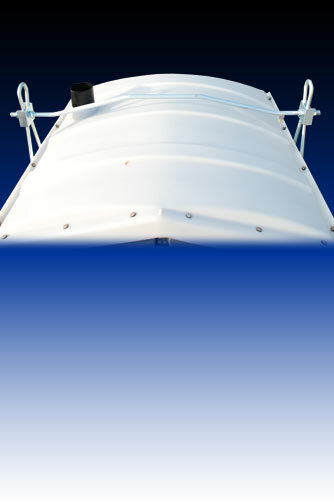 The OVER HEAD STEEL SLING is the ideal solution for just about every hard to reach location. Whether your job site is bridge and over pass construction, ship or barge construction, tunnel construction, train construction, sewer construction or an underwater construction jobsite, the OVER HEAD STEEL SLING can transport our full sized port a potty to your location. If you have a crane at the construction site, the OVER HEAD STEEL SLING attaches just like any other piece of equipment that is transported at the jobsite. The portable toilet can be lowered beneath the ground level or carried across the water to any location you need a full size portable toilet. Construction workers will be thankful to have the privacy and spacious interior of a standard portable toilet that would otherwise be unavailable without the OVER HEAD STEEL SLING. Bulky tools and clothing often worn by construction workers will fit comfortably inside this full size porta potty. The OVER HEAD STEEL SLING attaches to our standard size port o potty and is securely lifted by a crane and transported to any floor of a building, lowered below ground level or lifted across the water or other remote location. The crane lifts the port a potty similar as it would any other piece of construction equipment at the jobsite. 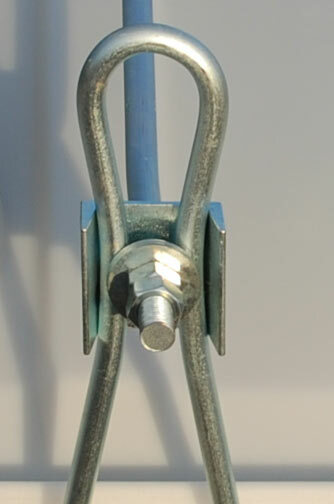 The OVER HEAD STEEL SLING has been specifically designed for the portable sanitation industry to lift portable toilets safely to where the toilet needs to be. The OVER HEAD STEEL SLING has many benefits to both the employer and employee. The employer will save substantial money by eliminating the need of their employees having to take valuable work time traveling to the portable toilet, such as to the ground level at the high rise building construction site. Time away from work indicates less production from your workers, which means more time required to complete the job. Over time, the amount of money saved by the employer is quite significant. Conveniently placed porta potties for your workers are guaranteed to save your company money. The construction worker in the skyscraper will benefit too, by having a full sized portable toilet right at their disposal. Supplying your workers privacy with the ability to maneuver inside the portable toilet easily will make for a pleasant trip to the restroom. The fewer trips traveled up and down a high rise building without elevators or stairs, the less possibility for accidents. The OVER HEAD STEEL SLING will eliminate the need for your employees to have to travel multiple times a day to the restroom. You will also reduce the chance of a worker getting injured at the jobsite by diminishing the need to travel far to the portable toilet. Best of all, the OVER HEAD STEEL SLING will provide your workers with New York’s greatest portable toilets, a CALLAHEAD. CALLAHEAD’s decades of experience providing high-rise building construction will give you piece of mind. There are many stresses in construction, especially high rise building construction. 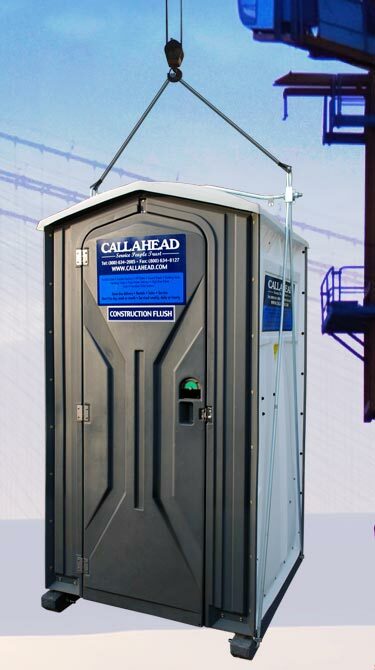 CALLAHEAD realizes you should never have to worry about sanitary portable toilets for your workers. Using only hospital grade disinfectants and cleaners, our clients can not only see, but feel the clean of a CALLAHEAD porta potty. Our trained delivery and service technicians are the true professionals in the field. We are the experts in all aspects of delivering, servicing and removing porta potties from high rise building construction and just about any other hard to reach location. Don’t second guess a company when you need reliable and sturdy equipment to lift a portable toilet to higher ground. 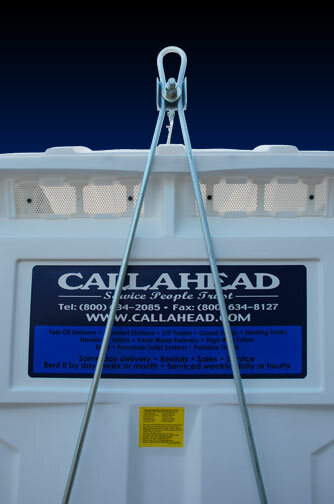 CALLAHEAD is a company you can trust for the safety, convenience and worry free portable toilets for your employees! CALLAHEAD’s OVER HEAD STEEL SLING is available for same day delivery throughout New York City. Our service areas include Manhattan, Bronx, Brooklyn, Queens and Staten Island in the five boroughs. We also service daily Long Island’s Nassau and Suffolk Counties and all of Westchester County. Our uniformed trained delivery and service technicians will arrive at your construction job site in our brand new and shiny clean vehicles. Their professional and courteous service is unparallel in the portable sanitation industry. Only CALLAHEAD guarantees like new equipment that promises to supply the greatest cleaning service in New York. Renting from the #1 portable toilet company, guarantees you will have no stress from the porta potties at your jobsite.